The first motor show of 2011 is in Detroit. Here's what to expect. Detroit is a cold and wet place in January. All except for the Cobo Center, where the first international motor show of 2011 takes place. The Detroit show's importance might be diminishing (and if recent years are anything to go by, the lights no longer shine so brightly on certain stands), but it's still the USA automotive industry's big hello to 2011. Confusingly, there are 2012 (or even 2013) model year cars there, along with fuel economy 'highway' mpg figures that to European eyes look absolutely rubbish. In among all that there is some interesting new metal. Detroit sees the global debut of Audi's new A6 saloon, including a hybrid model. The four-door model might not be a glamour-puss in the Audi range, but it's hugely important - especially in the USA. Plenty of recently new metal on the Audi stand alongside it too. As expected, the limited edition 1 Series M Coupé makes its world debut, as does the 6 Series Convertible. They both do a good job of overshadowing the facelifted 1 Series Coupé and Convertibles, also debuting. The best Cadillac can muster for its home audience is the CTS-V Coupé Racer - not a bad effort. It will race in the Sports Car Club of America World Challenge GT. Sadly, no 3 Series-rivalling ATS saloon, as mooted. Joining in with the 'downsizing America' theme kicked off by Ford, Chevrolet unveils the Sonic. It's basically the new Aveo supermini that we'll get in the UK soon, but with petrol power and suspension engineered by the Corvette guys. There's even a hot version, called the Z-Spec. The combined efforts of this odd marriage are seen in the shape of the new Jeep Compass and the facelifted Chrysler 300 (note the dropped C). Still a triumvirate in transition, we're promised a more dynamic Chrysler at motor shows to come. As ever, Ford pulls out the stops at its home show. It was the global Focus in 2010, and now Ford has unveiled the global Vertrek (the new Kuga to us) and the C-Max. There are hybrid and plug-in hybrid versions of the latter, too. A busy Blue Oval. There's nothing about the new Civic coupé and saloon that remotely relates to the European car, due at some point next year, says Honda. If that's entirely true it's a shame, because the Detroit world debutants are rakish and cool. Two massive debuts from the Korean company, both of which could propel the maker from manufacturer of decent and dependable to creator of the cool and curious. The Veloster coupé is an oddball four-door hatchback - work that one out - and the Curb is a futuristic Nissan Juke rival with hip young drivers in mind. 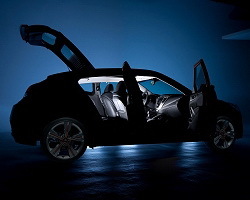 No showroom model debuts from Kia - which is overshadowed by Hyundai - but like its sister company, it too debuts a car of unusual door arrangement. The KV7 MPV concept has a solitary gullwing door and is more like a living room on wheels than a car. The Paceman is a coupé based on the Countryman SUV. Cynical? Well, we assure you it looks better in the metal than it sounds, and MINI likes it so much that it's pitching it as the brand flagship. Only Cooper versions and upwards - it won't be cheap. Porsche's stand supports arguably the star turn of Detroit 2011: the 918 RSR. Based on the sensational 918 Spyder, this hardtop racer focuses less on the environment and more on greasy fast speed. It's still a hybrid, though, and it has a surreal sort of 22nd Century turbocharger. If Toyota took the Prius away from America we could reasonably expect some bunny boiling, for its love of the car borders on obsessive: ten million sold and still going. Far from withdrawing, Toyota has expanded the range with world debuts for the Prius C supermini and the Prius V MPV. Neither coming to the UK, though. Volkswagen's expansion strategy involves 'localising' its model range - the opposite of what Ford is doing. To that end, Detroit hosts the world debut of the Passat XXL; it's like our Passat, but specifically tailored to the 'big is better' preferences of our American chums.